Our French green clay comes from deposits in the south of France. It is an illite type clay with a unique composition including Iron, Silica, Aluminum, Magnesium, Calcium, Titanium, Sodium and Potassium. French green clay is prepared for the commercial market by a process of sun-drying and crushing. After the clay has been mined, it is spread in the sun to remove excess water. It is then ground by large hydraulic crushers and micronized, or finely pulverized. The last stage in the process is a final period of sun-drying to remove the last traces of water. 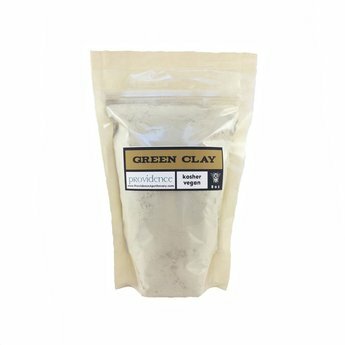 French Green Clay absorbs and removes impurities from the skin, tightens pores, and stimulates blood flow to create healthy and glowing skin. French Green Clay can be used in detoxifying body wraps, soap making, face masks, mineral based or cream based cleansers, face or body scrubs, cosmetics and facial powders. It is the more aggressive of the clay types and is suitable for all skin types except sensitive. Sensitive skin types should consider white clay. Some of the green color of green clay comes from the algae and other marine plant materials that were deposited with the clay. Store in a dry, cool, dark place. Shelf life is indefinite with proper storage.